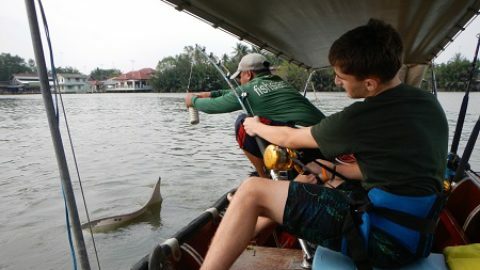 Rutger from Sweden decided to finish his Thailand fishing holiday with a trip to the Barramundi fishing ponds near Bangkok. On arrival at the lakes the Swedish angler adopted a roving approach and began to cast into the various ponds with Cultiva lures. With the high stocking density of the ponds it was not long before his Cultiva minnow pattern was violently attacked by a Barramundi. On setting the hook the Barramundi embarked on a series of wild acrobatic head shaking jumps in an attempt to rid itself of the hooks. Rutger kept a tight line on the fish expertly guiding it towards the waiting net where it was scooped up by the fishing guide. The Barramundi weighing 3.5 kg’s was an average size fish for the ponds and was soon slipped back into the water. Further searching casts resulted in yet more Barramundi which fought every inch of the way to the net performing lively aerial and acrobatic displays in the process. Rutger moved between the various adjacent fishing ponds catching from each pond in turn and regularily changed pattern of lure and his speed of retrieve. These tactics kept him in constant touch with the Barramundi allowing him to keep upping his rapidly growing total of fish. After a short break for lunch Rutger resumed fishing for the Barramundi and instantly started picking up better sized Barramundi. In the later part of the days fishing Rutger managed to bank several much larger specimens topped by a massive 10kg Barramundi. At the end of the days Barramundi fishing the Swedish angler had amassed a thirty fish haul topped by a gigantic double figure Barramundi weighing over 10 kg’s.